“Having a more experienced & successful counsellor guiding someone in a chosen profession is wise decision and good career move” In today’s competitive world, every student needs to clear the entrance exam to convert his dream into reality. Here we are going to discuss the NATA entrance examination which is National Aptitude Test for Architecture. To clear the exam, candidate has to get the right guidance and support which is of utmost requirement. This guidance and support is provided by the different coaching centres. Candidate must be very intelligent to choose good coaching institute regarding experienced faculty, good course & previous success rate. • TIPS (Training in professional skills) – It’s an institute of Architects with teaching experience of over 15 years. They impart appropriate knowledge & information about the field of architecture to the aspiring & budding designers. From the comprehensive study material to the excellent teaching and drawing faculty, they make the institute more reliable in terms of NATA entrance examination. The tips and tricks learned here will be of use not only in entrance exam but for lifetime. • BRDS (Bhanwar Rathore Design Studio) – This institute has almost a decade of experience in shaping the career of thousands of students in architecture field. BRDS is considered as one of the best institutes for NATA coaching in the Jaipur also called as pink city of India. The main and most appreciable thing about BRDS is experienced and hardworking faculty of the institute. The study material provided to the students is analysed by the faculty and revised time to time to keep the students updated. This institute helps in instilling creativity which is required not only in entrance examination but also in future. Ongoing support provided by the mentor of institute is the main attraction. It is indeed one of the best NATA coaching institutes in Jaipur, owing to the above-mentioned reasons. • Inspiration Art and Education – Inspiration was incorporated to impart quality education to students preparing for NATA entrance examination. 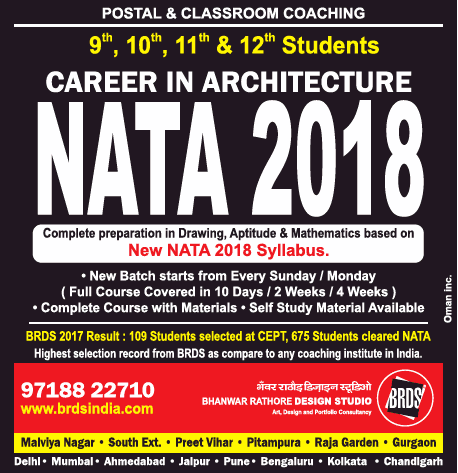 Now, because of the excellent teaching methodology that Inspiration has evolved as an epitome of success, it is considered amongst the most prestigious institutes for NATA entrance exam. Because of the limited seats in the batch, every student gets personalized attention and support. The other highlight of this institute is its study material which includes previous years papers also. • GM Classes – GM Classes is considered as an ideal platform to begin your journey towards success and many achievements to come in the life of NATA aspirants. GM classes have fetched best results in many design entrance examination. GM classes are known to be the best for NATA coaching classes in Jaipur. They have the best faculty members in terms of qualification and experience and those who actually ensure 100% success of NATA aspirants. Blend of manual and digital coaching helps candidates to shine separately among the thousands of students. Regular test series, performance analysis and feedback system further ensure the high chances of success of every student. Regular updating of study material and teaching content further help in training the students as per the current examination trend. • Art & Design Academy (ADA) – ADA came into existence in 2007, with an aim to provide good knowledge to the NATA aspirants, so that they can clear entrance examination and pursue their career in the field of architecture. ADA is known for its outstanding and dedicated faculty. Expert methodology which is enough to provide comprehensive and systematic guidance and support to the candidates. ADA is famous for giving excellent results in NTA/JEE/NID/NIFT/Fine arts examination. 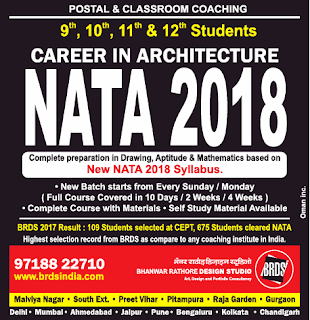 Most comprehensive courses, class tests and regular assignments, regular feedback on your previous performance, home assignments, career guidance along with entrance exam preparation, solving last year papers are some of the features of ADA which makes it the one of the best NATA coaching institute in Jaipur.